I did some volunteering with Trees Atlanta recently. In one of their offices they had this 10-year-old map of the Atlanta Beltline, with plans for the surrounding landscapes. Very cool to see this early vision – and a different one than the neighborhood/transit-focused one we’re used to – back when it was mostly just a dream. It still is, but it’s also on its way. I like that they still have it around. Atlanta’s MARTA Map – Super Mario 3 Style. Lil B sums up summer in Atlanta. Eyes that have seen a lot of stuff in Downtown Atlanta. From the Eiseman Building to the Five Points MARTA station. Atlanta is a sports town, just not one that resembles other major league cities. To understand Atlanta’s relationship with the Hawks, it’s necessary to understand that the common cultural heritage of the metropolitan area tends toward living in the suburbs and the tribalism of college football. To believe Atlanta is not a good sports town, it’s necessary to believe college football is not a sport. Atlanta to Atlantis: An OutKast Retrospective | Pitchfork. Essential reading. The poet and the player was the tagline; the truth is that you never knew who was who. Dude on MARTA dances alone in the center of the car. He’s good! An onlooker criticizes, says he’s not dancing “ATL enough” & challenges him. The onlooker gets up and dances to show how it’s done. He’s good too! They dance battle. Everyone else is half-delighted, half-uneasy. We pull into a station, they stop. Meanwhile, a woman gets caught moving between cars. The door jams! Moment of panic, then she tumbles out. She nearly falls over, regains footing by momentum-dancing up the aisle. She’s embarrassed but rolling with it, right toward battle dudes. Battle dudes recognize her embarrassment & dance-beckon. They all dance together until the next stop. Everyone is delighted! Cheers erupt. “Yo, who wants to buy some liquor? !” He opens a backpack revealing like twenty mini vodka bottles. And right then, the door opened: my stop. How a Densely Populated Neighborhood Became Turner Field: A Map Essay | Georgia State University Library Blog. Saying Good-bye As the Braves Leave Atlanta for ‘Atlanta’ – Grantland. Nothing in this message is a lie, or even exaggerated, once you realize who the audience is. This message isn’t directed toward the Atlanta city-dweller. The “you, our fans” is not targeted at a person who lives in the city of Atlanta. It’s targeted at everyone in that dark-red blot that lives in the city’s northern suburbs. If you’re a fan who lives in these suburban areas, today is a great day. It has long been a hassle to get to Turner Field — because it involves going all the way to Atlanta to see the Atlanta Braves. All Not Lost: Great Old Buildings & Historic Districts of Downtown Atlanta | Georgia Globe Design News. 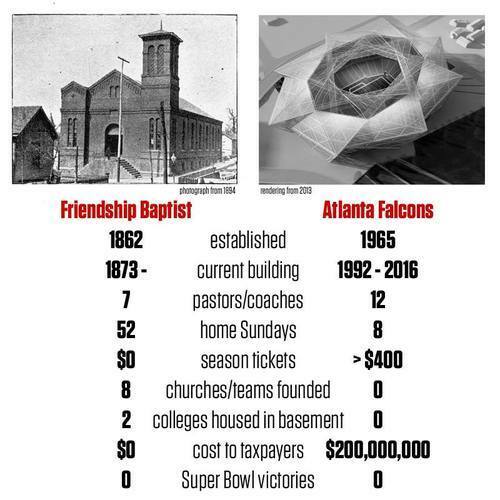 A very clever person named Kyle Kessler put together this chart, helpfully comparing Friendship Baptist Church and the Atlanta Falcons. One of two possible sites for the construction of the new Atlanta Falcons stadium would require the purchase and demolition of this 1873 church building. Dance floor at Burt’s Place, a short-lived ATL restaurant/nightclub. MARTA could reduce average wait times and improve customer satisfaction by extending the Blue Line Train’s final eastbound destination from Candler Park to Indian Creek during rush hour. As a frequent rider on the eastbound Blue Line train, I often wonder why MARTA runs a short train that terminates service at Candler Park instead of continuing on to East Lake, Decatur, Avondale, Kensington, and Indian Creek stations. This odd routing decision adds up to 7 minutes—not an insignificant amount of waiting time—to each one-way trip for riders traveling eastbound from Five Points to stations beyond Candler Park. I’m often struck by how few people get on the “mini” train, but I figured I was missing something because surely MARTA would only do this extra level of service to customers headed to heavily used stations. Yep, the short route is kinda ridiculously empty in the mornings.